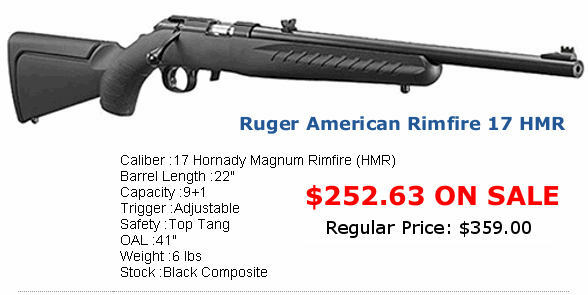 Here’s a great deal if you have a hunting rifle chambered in .308 Win or .223 Rem. Right now, for under $250.00, you can get a Nikon scope, a set of cantilevered rings, plus a Wind Meter that plugs into your smart-phone. The $249.99 P-308 Package features a 4-12x40mm Nikon Scope with BDC reticle calibrated for.308 Win. Likewise the $199.99 P-223 Package offers a 3-9x40mm Nikon Scope with BDC reticle calibrated for the .223 Remington. These cantilevered rings work well with AR-platform rifles. If you are serious about your precision firearms, you need one of these. 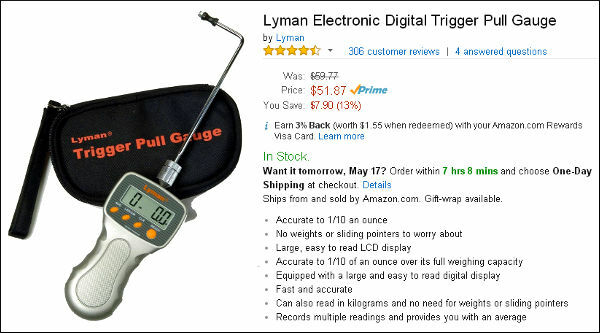 We use the Lyman Electronic Trigger Pull Gauge to test the triggers on all our match and varmint rifles. The unit is precise and repeatable. Once you try one of these you won’t want to go back to crude spring trigger gauges. Amazon.com offers this unit for $51.87 with free shipping for Prime members. Walmart also has it for $51.87 with free shipping or free in-store pickup. Natchez is running a great special right now on quality Dewey Cleaning Rods. These bearing-equipped rods are very well made and can last for many seasons. This editor has a couple Dewey rods that are still going strong after 12 years. For just $19.99, you can get either a 36″ or 44″ coated Dewey rod. NOTE: Select “.22-.26 cal” from the pull-down menu (the other options are for short pistol rods). It’s hard to beat a quality cleaning rod for under twenty bucks. Credit Boyd Allen for finding this bargain. 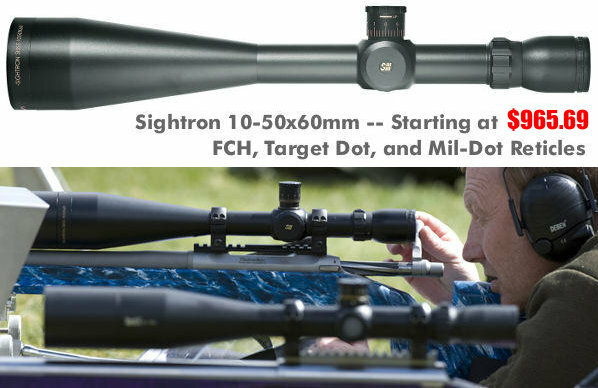 This 10-50X Sightron isn’t as good as a Nightforce 15-55X Competition scope, but it is definitely good enough to win long-range benchrest and F-Class matches. At $965.69, the Sightron is nearly $1400 cheaper than the 15-55X Nightforce. It is even $450 cheaper than the old 12-42x56mm NF Benchrest scope. On a value-for-money basis, then, the Sightron 10-50x60mm makes sense for competitors on a budget. The money you save (compared to a 15-55X NF) will pay for a BAT or Kelbly action, with money left over. Looking for a reliable ultrasonic cleaning unit at a rock-bottom price? Here’s a very good deal — this new Lyman 1200 sells elsewhere for up to $110.00. This machine will hold up to 350 9mm cases, and clean them in 10-15 minutes. The see-through cover lets you view the progress in the 6.5″L x 5.4″W x 2.6″D heated tank. Select four different dwell times with handy touch controls. Need high-capacity magazines for 3-Gun competition or a tactical match? Then check out this great Magpul deal from Brownells.com. Right now you can get TEN (10) high-quality Magpul PMags for $99.99. These GEN M2 MOE PMags are excellent .223/5.56 AR15 magazines that set the industry standard for functionality, reliability, and durability. The NRA Convention runs this week in Louisville, KY — so there’s no better time to become an NRA member. Plus, if you join right now you can get a free duffle bag, in either black or camo fabric. In addition, the regular NRA Membership is discounted from $40.00 to $25.00. With your NRA Annual membership you also get your choice of four (4) print magazines: American Rifleman, American Hunter, Shooting Illustrated, or America’s 1st Freedom. Share the post "Bargain Finder 35: AccurateShooter’s Deals of the Week"